Earlier this week, The Prince of Wales and The Duchess of Cornwall hosted a charity event in aid of the endangered Asian elephant at Clarence House. 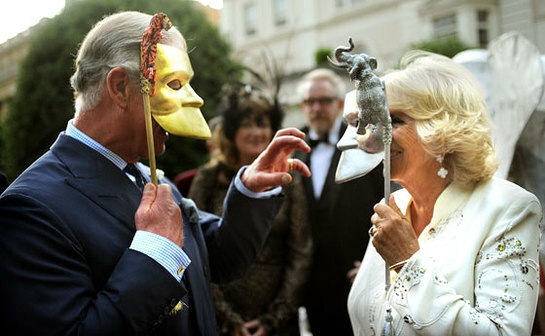 Scores of guests attended the garden party and masked ball in ornate, colourful creations. The Prince and Duchess were presented with heraldic masks to wear, The Prince’s with a silver elephant on it and The Duchess’s with a tiger. The event was held to raise money for the Elephant Family, a charity co-founded by The Duchess’s brother, the conservationist and writer Mark Shand, 62. Since its launch in 2002, the charity has invested more than £6 million in conservation projects across Asia, working to secure elephant and wildlife habitats and highlighting the animals’ plight. The Prince is a keen supporter of conservation and in May this year along with his son The Duke of Cambridge, hosted an End Wildlife Crime summit at St James’s Palace. Guests at the Elephant Family event included supermodel Cara Delevigne and her sister Poppy, also a model, as well as the painter Jack Vettriano who was auctioning off a work, Jerry Hall, Imran Khan, Jools Holland, racing legend Jackie Stewart and the actor Rupert Everett.